The scientists mapped the numbers of organisms in relation to geothermal areas—volcanoes, mostly—known to have been active since the last ice age. They found the number of species was greatest at or around such sites, which the scientists said reflected volcanoes' role as ice age refuges. Antarctica has about 16 volcanoes which have been active since the last Ice Age 20,000 years ago. The scientists mapped the numbers of organisms in relation to geothermal areas—volcanoes, mostly—known to have been active since the last ice age. They found the number of species was greatest at or around such sites, which the scientists said reflected volcanoes' role as ice age refuges.Volcanic steam can melt large ice caves under the glaciers, and it can be tens of degrees warmer in there than outside. Caves and warm steam fields would have been great places for species to hang out during Ice Ages,” said lead author Dr Ceridwen Fraser from the Australian National University. Science Monitor. The Christian Science Monitor, n.d. Web. 12 Feb. 2015. Pappas, By Stephanie. 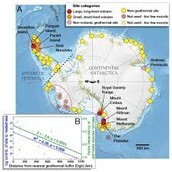 "Hidden Volcanoes Melt Antarctic Glaciers from Below." LiveScience. TechMedia Network, 09 June 2014. Web. 23 Feb. 2015. "Volcanoes May Have Helped Life Survive Ice Ages." Breaking Science News SciNewscom. N.p., n.d. Web. 12 Feb. 2015. "Were Volcanoes Ice Age Refuges for Life?" National Geographic. N.p., n.d. Web.